Critical Art Ensemble has been investigating the possibilities of nomadic resistance on polyspacial levels for sometime now. First, by attempting to articulate what "civil disobedience" might mean within the frame of dematerialized power; second, confronting the aporia between the Left's need to rationalize resistance and the non-rational autonomy of a radical 'nomos': the "...explosive and unstoppable moments of excess, waste, sacrifice, abjectivity, spontaneity, mania, and uselessness...." CAE's recent research calls for electronic cells to organize against "the information Bunker" and that the internal group dynamic should be one of critical singularities mirroring each other in an act of faith. 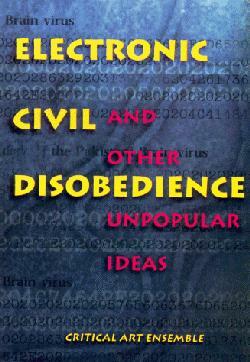 CAE's Electronic Civil Disobedience (and Other Unpopular Ideas) is a recombinant reading of Bataille's Theory of Religion, and his The Accursed Share, they too are seeking to puncture, expropriate, and recycle Digital Authoritarianism use of the irrational to control and command pan-capitalist flow. To create zones wherein possible moments of social and personal autonomy may occur CAE, as in the case Bataille's Acephalic Society, is willing to risk a certain state visible sacrifice effects--"CAE would still rather face the anarcho-facist problem of slippage, and cope with the visibility of the abject, than live as an abstraction within the authoritarian yoke of efficiency under the vision of the state-sponsored hyperreality." This problematic gesture has seemingly always/already been in the hands of extreme ideological Bunkers. CAE's analysis of our current situation and their call for a radical political 'nomos' recalls, again, Bataille's movement away from the question of direct political action in 1936 of the group "Contre-Attaque" and towards the secret Acephale cell that attempted to understand fascism: "Its main goals were the rebirth of myth and the touching off in society of an explosion of the primitive communal drives leading to sacrifice. Myth...is the way open to man after the failure of art, science (and scientific notions of causation), and politics to reach these lower--more 'essential'-- human drives...."(The Unavowable Community, Maurice Blanchot). The question that must be asked of CAE's acceptance of the non-rational as a foundation for digital cell autonomy is this: what makes the 'nomos' strategy worth the rerun now? It has already failed twice, first in 1939, and then at the end of the 60's--by the 70's 'nomos' became the smiling face of New Age fascism. Must the possibility of electronic resistance fall back on a reversal of the binary--rational to non-rational--in order to function within our current cyberscape. One has to wonder why code calls forth such an aggressive mysticism--not just from the "Higher Source" types, but from so many critical and aesthetic threads. If it's not Hakim Bey's Gnostic rants, it's the wonder of new states of becoming which are the outcome of 'immersive environments'--which are nothing more than Plato's shadow Bunker shutting down around us again. It's time to drift away from the eternal return of the same--just say no to rerun culture. The cyberscape is rich with countless rhizomatic tendrils. Recombinant perceptions weave our cyberfuture. There are no true reruns here, because these are vast new zones of blended voices. We haven’t had time to fully sort out what we’re experiencing, because we’re living at the speed of digital communication…Not fast enough for mind2mind links, but alwaysalready too fast for our flesh. Current flesh realities and economic/cultural paradigms simply do not map well to digital culture. We can’t yet speak about all the implications, because we don’t really know what they all are -- besides, much of it is experiential; more than words can express. Still we’re inventing the vocabulary. Cyberspace is intangible, but you can live there. So we need myth. We are code. Now it’s extended beyond our genetic structure to become cyberscape’s foundation. That’s great myth material. Some of us have been happily worshipping code for decades. Ohers are just realizing, they have no choice, it’s already part of their lives. Not everyone is happily digitized, but we all already are. And we didn’t feel it when it happened. That’s intimidating. That’s powerful. Loved, worshipped, resisted, misunderstood, feared, whatever – Code is excellent myth material.